On May 8, 2015, a record 600 parents and children rallied on Stand for Children Day, thanks to LA-based Community Voices and Bay Area-based Parent Voices, whose statewide organizer, Mary Ignatius, summed up their message, “Child care keeps parents earning and children learning.” Children at Stand for Children Day sense their importance and their power to improve lives. 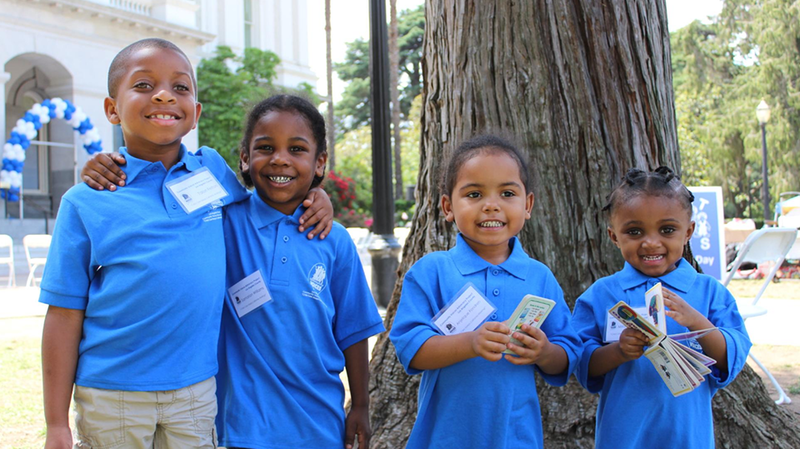 Sacramento – Anticipating the governor will maintain a conservative fiscal outlook and hesitate to keep previously promised budget commitments, 500 parents and children will rally tomorrow, May 10, at the state capitol and meet with their legislators to address policies that limit access to affordable child care. Parents are deeply concerned that failure to address 10-year-old outdated income eligibility criteria, coupled with increases to California’s minimum wage and high cost of living, forces thousands of parents out of the state subsidized child care system, threatening their ability to maintain their jobs and progress toward economic self-sufficiency. This year’s Stand for Children Day starts with a rally at 10:15 a.m. on the South Capitol Steps on N Street in Sacramento. The rally will be followed by a march around the capitol at 11:30 and legislative visits at 1:00 p.m.
Last year, California lawmakers raised the minimum wage so that people would be paid more fairly for their work. 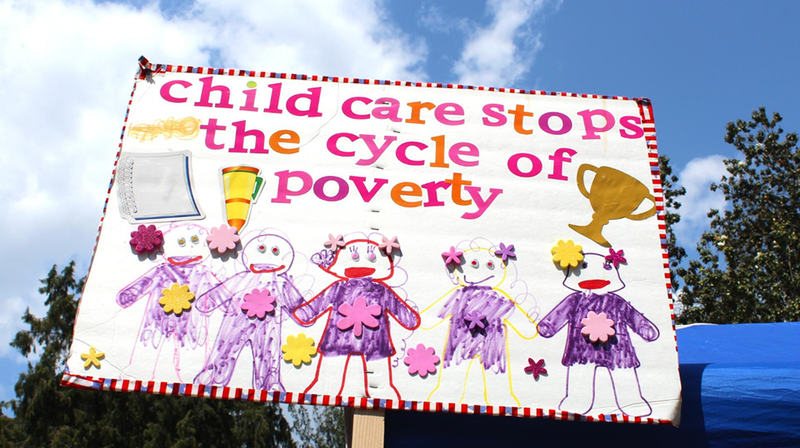 But the extra 50 cents an hour has caused many families to lose their affordable child care. “I got a small raise and now I am $30 over the limit – but the limits haven’t been updated since 2007. I am very proud of the raise I have earned, but I wish I could turn it down because losing my affordable child care makes my family much worse off. “If they want to use 2007 guidelines, they should use my 2007 paystubs!” said Francis Brown, a mother of two attending the rally. Parents were disheartened when Gov. Brown’s proposed budget for FY 17-18 did not include new funding for child care and are hoping that his May Revision, due on May 11, will be different. The Assembly Budget SubCommittee #1 on Education and most child care advocacy groups rejected the governor’s January proposal. Instead, they are asking the governor to stick to last year’s agreement to raise child care provider reimbursement rates to keep up with the new minimum wage, and this year to update the income guidelines for parents who need affordable child care to work. Parents take the day off of work on Stand for Children Day and travel to Sacramento to share their personal stories and hopes for secure, stable, affordable child care and preschool for their children. Parent Voices hopes to influence state lawmakers’ decisions over funding in the next few weeks. Parent Voices is asking lawmakers to align child care policy with today’s wages and cost of living. The state budget should update income guidelines that have been frozen for over a decade, reject the governor’s proposal to “pause” increasing reimbursement rates, and streamline reporting requirements so that disruptions to children, parents, employers and child care providers are minimized. Parent Voices is co-sponsoring AB 60 (introduced by Assemblymembers Santiago and Gonzalez-Fletcher) that will allow parents earning the new minimum wage to keep their affordable child care and AB 273 (introduced by Assemblymember Aguiar-Curry), which will unlock child care opportunities for families seeking to take ESL or GED classes. Three youth leaders at tomorrow’s rally will share their personal stories related to child care, immigration and the impact of last week’s House Republicans American Health Care Act and what it will do to a child who suffers from chronic asthma. They will be joined by Assemblymembers Cristina Garcia, Lorena Gonzalez-Fletcher, Miguel Santiago, David Chiu and Tony Thurmond, as well as Sens. Holly Mitchell and Connie Leyva, who each shared their support for expanding access to child care. After tomorrow’s rally, families and children will carry signs and banners as they march to the capitol. They will meet with their legislators and deliver flowers in honor of upcoming Mother’s Day. Parent Voices is a parent led, parent run grassroots organization fighting to make quality child care accessible and affordable to all families. To learn more and get involved, contact Parent Voices Statewide Organizer Mary Ignatius at mignatius@rrnetwork.org or on Twitter: ParentVoicesCA. And contact the California Child Care Resource and Referral Network at 1182 Market St., Suite 300, San Francisco, CA 94102. They say childcare will stop the ever going cycle of poverty. It is so true. But this child care also let them grow with proper mind and healthy condition which will let them be something valuable in future days.